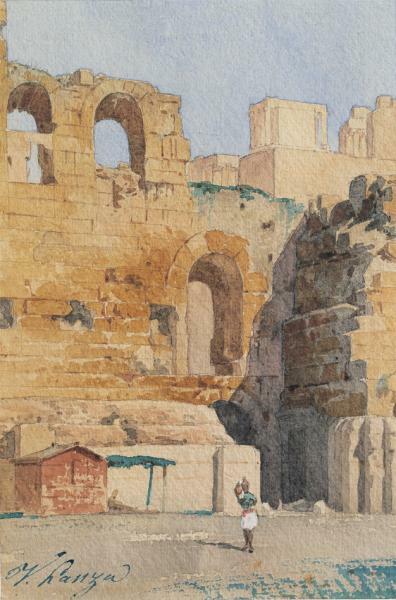 His work mainly comprises landscape views of archaeological sites, often in watercolour, combining a Neoclassical style with a Romantic spirit. He studied at the Academy of Venice, in which he taught for some time after his graduation. 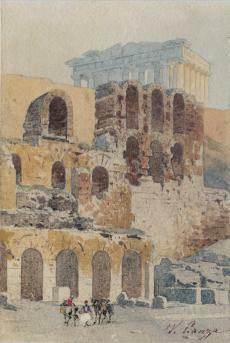 Due to the unsuccessful outcome of the Italian uprising in 1848 against the Austrians, in which he participated, he sought shelter in Greece, where he lived first in Patras and then in Athens.He decorated Queen Amalia’s summer house and, on King Otto’s commission, painted the Camp of Thebes. He completed the painted decoration of the Russian Church in Athens and received a gold medal from Tsar Alexander II. He created the ceiling painting of the Universityof Athens Hall. In 1863 he became professor at the School of Arts in Athens; he also taught at the Army Cadet School. He participated in theParis Exposition Universelle (1867). His work comprises mainly landscapes with archaeological sites, often in watercolour, combining a Neoclassical style with a Romantic spirit.